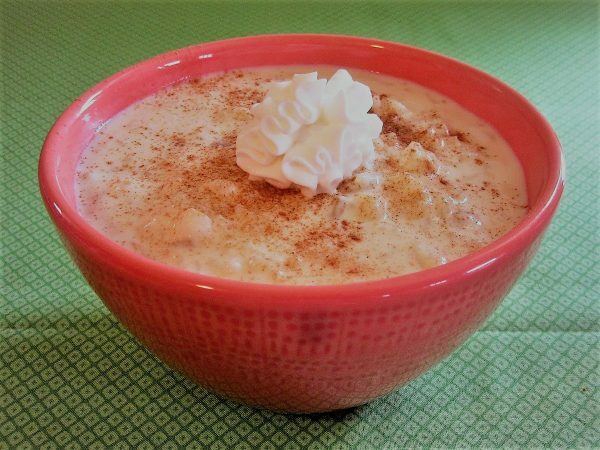 Living for so many years in Western New York State, we were privileged to have a great many Greek restaurants who all competed for serving the BEST Rice Pudding. And these were fabulous, rich, creamy, soul satisfying Rice Puddings. For anyone who says they do not like Rice Pudding, like Sparky, well you just haven’t tried the best! Dan said he didn’t think he liked a Rice Pudding, then proceeded to eat the entire batch and asked when we were having it again. That, in my opinion is a 5 Star rating! I tend to age recipes by how old my son is and he is 38 y/o so I would guesstimate that I have been making this version for at least 35 years. 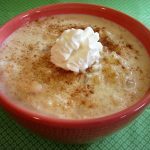 I have no idea if “Greek” rice pudding is authentic to Greece, all I know is if you go to Buffalo, NY, it will be on every menu and everyone loves it! My son and daughter absolutely loved it and if I made it every week they would devour it every week. My recipe makes 10 servings so it is perfect for family dinners and pot luck dinners too. Enjoy! This is what we will need. Well this and 6 cups of whole milk! My secret is in not using plain old long grain rice. I use Jasmine Rice which gives this an extra boost of flavor and a lovely enticing aroma. Plus, incorporating Golden Raisins gives this a lighter sweeter touch than dark dry purple raisins. The end result is the Rice Pudding of your dreams. Smooth, thick with a touch of Cinnamon, nothing is better. Pure comfort food at its best! This recipe may have a long er cook time but as with all recipes that require time, I prepare it while I have other work or cooking going on in the kitchen. You know, that old multi tasking thing! 2/3 Cup Jasmine Rice I have also used Basmati which is terrific! Get out a large 8 qt Saucepan. 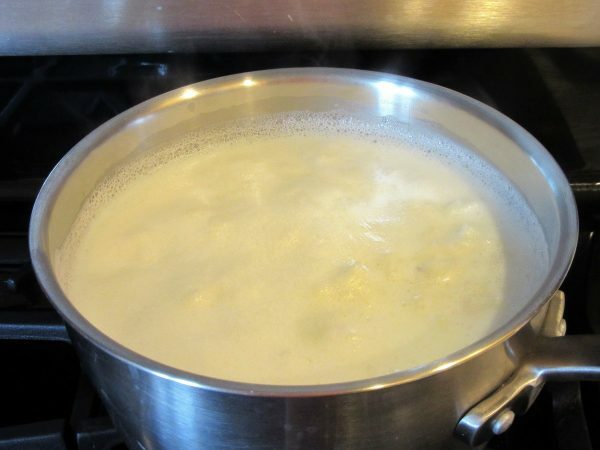 Place the Jasmine Rice, Sugar and 6 cups of whole Milk in the saucepan. Give it a quick brief stir, then LEAVE IT ALONE. Cover and heat this mixture over a low-medium heat until it begins to steam, about 20 minutes. Uncover and add the Golden Raisins and stir to combine. Lower the flame to a bare simmer, cover the pot loosely and and cook for 45 minutes, stirring frequently until the Rice is tender. Beat your 2 eggs together with a fork until well combined. This part is important. You don't want the yolk and whites to be separated. Get them really well combined. Only takes a minute or 2. 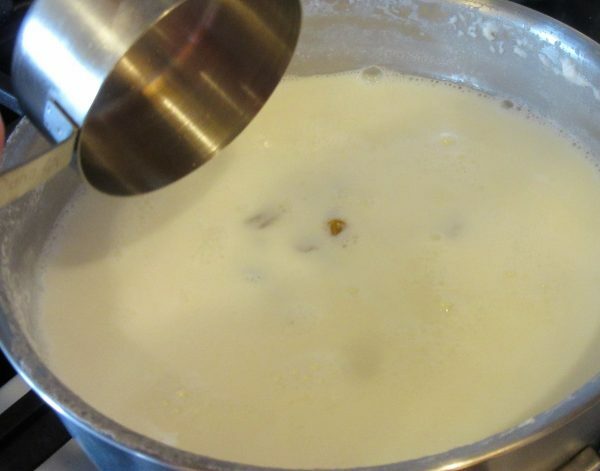 Add the Evaporated Milk and the Vanilla Extract, stirring until well combined. 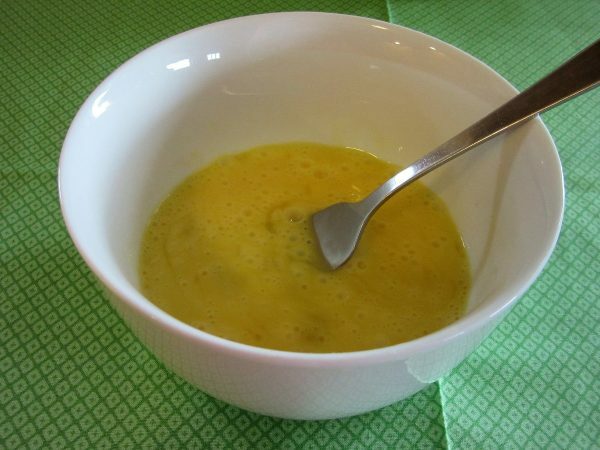 After 45 minutes is done, slowly pour the Egg, Evaporated Milk and Vanilla mixture into the Rice mixture. Cook and stir over low heat until the mixture thickens. 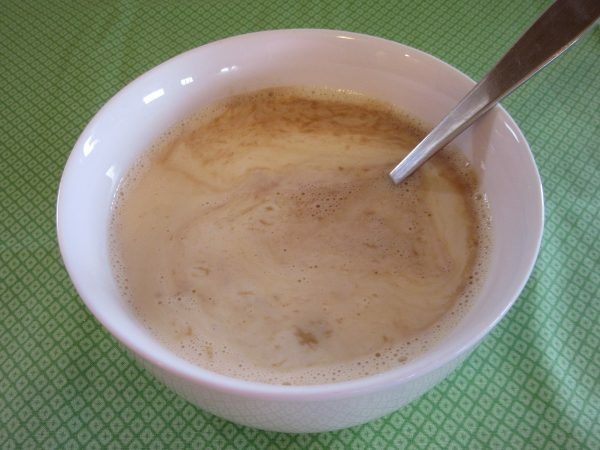 Do not let it boil or you will have a curdled mess. 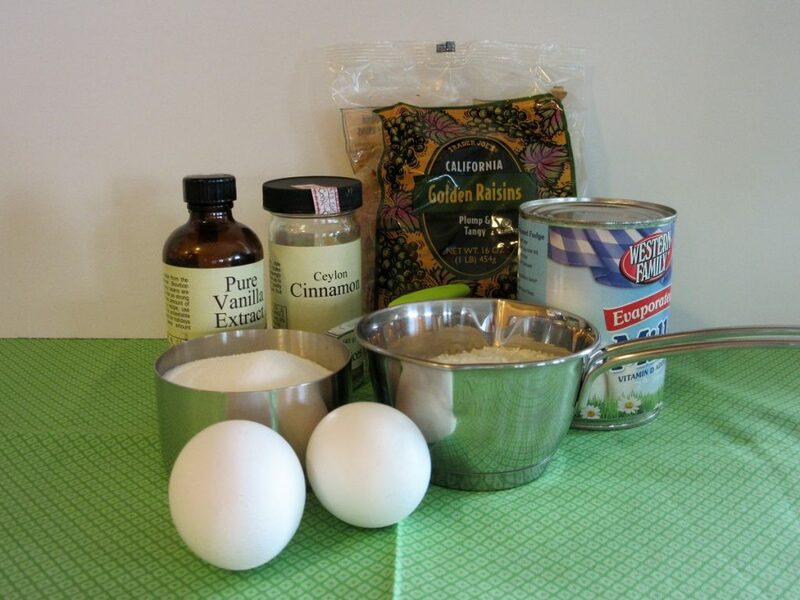 When thickened, spoon the Rice Pudding into a large serving bowl and sprinkle with Cinnamon. Cover with plastic wrap and refrigerate until cold. 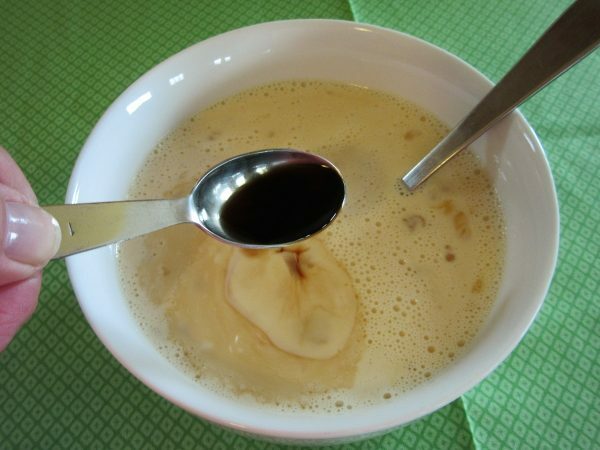 Serve with a dollop or 3 of Whipped Cream and prepare yourself for a real treat! Thanks so much for stopping by today friends. I truly enjoy sharing my life and love of cooking with you all. Please feel free to leave me a comment. I LOVE hearing from you all! My wish for you today is a life that is rich, delicious and enjoyed with family and friends! Hi Linda, I hope you like it! It truly is amazing. Kids and adults love it! This recipe must be the exact one my mom (who is from Buffalo, NY) used to make! She made it so many times she memorized it so it wasn’t in her recipe box after she passed away. I recently made it for my dad & he asked me to make it again for him a few days later it tasted so good! Thank you very much for posting it!! So glad this recipe brings back loving memories of your Mom! And I’m very happy your Dad enjoyed it.